SQL Stored Procedure & SQL Triggers, both are the important objects of SQL. SQL stored procedure are the set of logically group of SQL statements which are a group to perform a specific task. Trigger are also similar to SQL Stored procedure as they can also be a set of logically group SQL Statement but they are needed to perform some predefined action for automatic execution whenever users try to execute data modification commands (INSERT, DELETE and UPDATE) on the specified tables. Triggers are defined on Tables and whenever any Insert /delete /update command executed on these tables, SQL statements defined in the SQL trigger got executed. This article will going to cover the difference between Stored Procedure and Trigger. SQL Stored Procedure and SQL Trigger are one of the important objects of SQL Server. 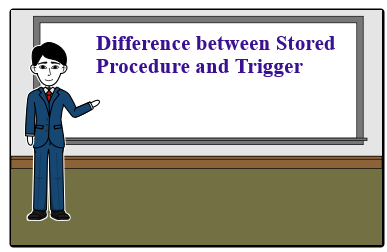 This article tells about the difference between Stored Procedure and Trigger.